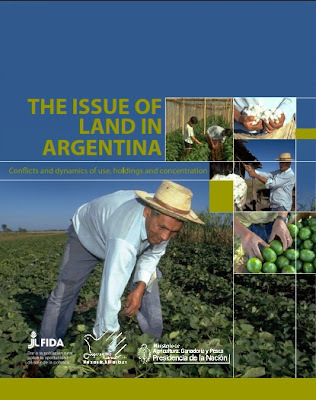 The purpose of 'The Issue of Land in Argentina' is to identify the central issues around land tenure and management in Argentina in light of the global changes in agriculture and rural territorial development. In addition, a series of policy options are put forward to address the most conflict-ridden situations, keeping in mind the goals of equity and development. The scope of this study encompasses a comprehensive analysis of the land dynamic. As well as seeking to achieve that ambitious objective, this study should be considered as input to a broader debate on such issues on the path to formulate a national land policy. Land distribution, tenure and use are subjects of growing interest in Argentina given the prominence these kinds of issues have acquired in recent decades: the concentration of land by certain business concerns, purchases of vast parcels of land by urban and external investors, the displacement of small producers in agricultural areas, and new models of agricultural management dominated by leasing. Such issues are a clear manifestation of a shift in the way land is organized and developed in Argentina and in the prevailing agricultural model. Understand Spanish? Read the entire study.